If you have received arrears of salary/pension in Financial year 2018-19 related to previous year(s) then your tax liability will be on higher side due to arrears but do you know that you can bifurcate your income from arrears in respective years on notional basis and can avail relief u/s 89(1) of Income tax Act ,1961. We have prepared a small excel calculator which will be helpful in calculate the relief under 89(1) for arrears received in financial year 2018-19 and arrears relates maximum older up to financial year 2005-06. Fill year wise break up of arrears received in financial year 2018-19 under respective years.Total will automatically shown under FY 2018-19 . Arrears column(C-12 of calculation sheet) under Fy 2018-19 is protected and can not be edited ,If you have received arrears related to Fy 2018-19 in Fy 2018-19 it self then it is not covered under the definition of arrears and to be included in total income of Fy 2018-19(C-11 of the calculation sheet). 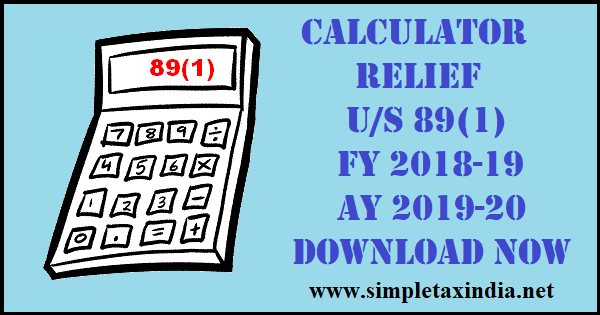 If are not able to download the calculator,then download from page-2 directly or mail us a request at raniraj1950 at gmail.com with subject " 89(1) relief calculator Fy 2018-19"